Sweetwaters Tented Camp is located at the center of the 110,000acre Ol Pajeta Conservancy in Laikipia, 217Km from Nairobi. Ol Pajeta Conservancy is said to be the largest black rhino sanctuary in East Africa, and also the highest wildlife to area ration in the country. 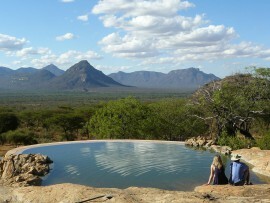 Sweetwaters Camp is set around a watering hole where guests can see animals in close quarters as they drink. Located on the plains of Mount Kenya, the camp features thirty-nine luxury tents, each with its own private veranda overlooking the water hole. 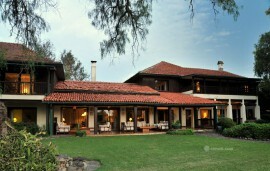 The central Rhino Restaurant is housed in the former manager’s house of this once colonial farm, and offers both regional and international cuisine. Sweetwaters Tented Camp offers accommodation in 39 luxury tents 12 of which are doubles and 27 are twin rooms. Baby cots and extra bed are available on request. The tents are built in two rows around the water hole. 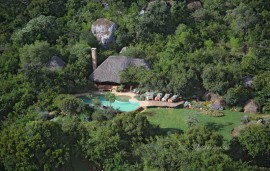 Each tent has its own verandah overlooking the waterhole. The tents are ensuite, with hot and cold water and flush toilets. They are also fitted with wireless internet and telephones. Others are complimentary mineral water and toiletries, hot water bottle and mosquito nets on request. Electricity is provided by a 24 hour generator. Also within the house is the Kashoggi Bar and lounge, which centres on a blazing log fire. 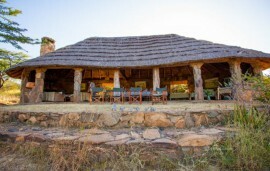 The Waterhole Bar, built in the style of a game-viewing hide, overlooks the waterhole and offers unrivalled wildlife-watching. For those wishing to conduct their conferencing/ team building out in the world, Sweetwaters has a dedicated conference room located in the beautifully landscaped gardens. The conference room is modern and features modern furniture, PA system, LCS projector, podium, flipcharts etc. Also available is a business support center to make sure the conferences run smoothly.